I rode my first race for Planet X yesterday. I knew saying that would sound weird - the Planet X team has featured some quality riders over the years. Think original road hardmen Lovatt and Tanner in the early days, right through to the current crop of talented young riders and triathletes. Definitely way, way out of my league. However, the recent growth of Planet X sister company On One's stable of bikes with the new Dirty Disco cross bikes, as well as mountain bike brand Titus means the addition of a more eclectic bunch of largely Northern based crossers and mountain bikers to the fold. I'd 'appropriated' the Dirty Disco from the then incapacitated team rider Dave Haygarth back in October and have waxed lyrical about it ever since. It's been really exciting to be in at the beginning of the disc brake revolution (yes, that's what it is) within cyclocross and my ridings and reviewings have hopefully aided On One in establishing a firm footing within this new emerging market. Either way, I've been taking the Disco around everywhere, and it has generated a great deal of interest at races and on the social networking sites that I share with a growing chunk of the cyclocross community. Discs will eventually become accepted as the norm, as the technology develops further and more efficiently and the Disco as a disc-only, affordable all carbon frame will no doubt become as well loved and used as the Planet X Uncle Johns that I and many others have been riding for years. And my race? 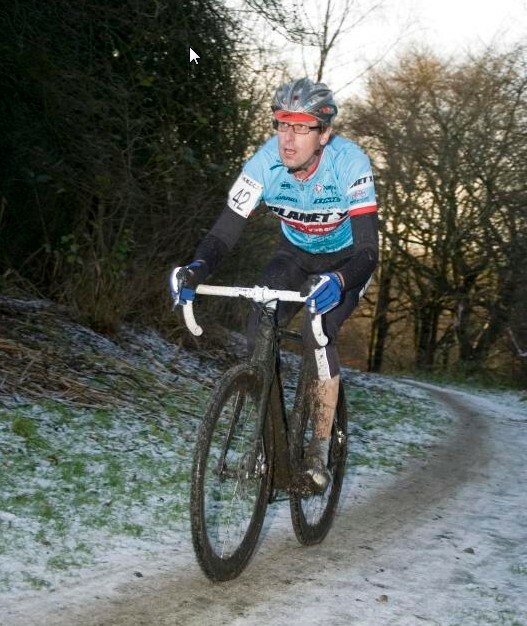 That went OK too - not as far up as I would have liked to have been, but hovering around the top 20 in a combined Senior and Vets field at Leverhulme Park, Bolton on a suitably muddy and slushy course. No clogging issues at all in really quite bad conditions, though I did change bikes mainly because I needed to keep my young son on his toes in the pits. The dirty (no pun intended) bike immediately got reused when I offered it to a fellow competitor who had broken his own rear mech and had no clogging issues for the rest of the race. Best bit? Hoofing down the main wooded descent, drifting both wheels delightfully whilst feathering the discs for control. Steep, slippy descent - one finger braking control. That's the Disco experience in a nutshell.